Computer Advancements - Welcome to Our Generation USA! covers the many forms of computer technology, whether hardware, software, applications, or computing standards. YouTube video of "Information Age: The computer that changed our world"
​​A computer is a device that can be instructed to carry out sequences of arithmetic or logical operations automatically via computer programming. Modern computers have the ability to follow generalized sets of operations, called programs. These programs enable computers to perform an extremely wide range of tasks. Computers are used as control systems for a wide variety of industrial and consumer devices. 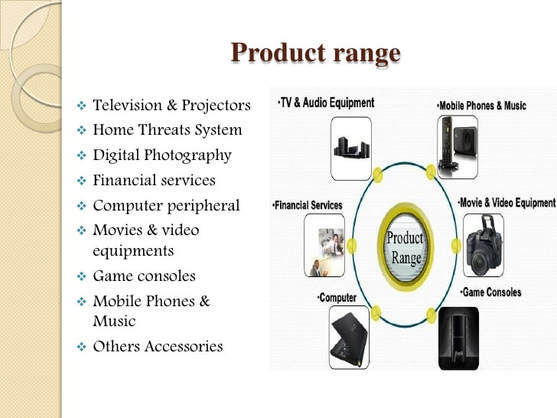 This includes simple special purpose devices like microwave ovens and remote controls, factory devices such as industrial robots and computer-aided design, and also general purpose devices like personal computers and mobile devices such as smartphones. Early computers were only conceived as calculating devices. Since ancient times, simple manual devices like the abacus aided people in doing calculations. Early in the Industrial Revolution, some mechanical devices were built to automate long tedious tasks, such as guiding patterns for looms. More sophisticated electrical machines did specialized analog calculations in the early 20th century. The first digital electronic calculating machines were developed during World War II. The speed, power, and versatility of computers have been increasing dramatically ever since then. Conventionally, a modern computer consists of at least one processing element, typically a central processing unit (CPU), and some form of memory. The processing element carries out arithmetic and logical operations, and a sequencing and control unit can change the order of operations in response to stored information. Pictured below: What is an Operating System, and what tasks does the Operating System perform? Click here for a list of Operating Systems. ​A computer operating system (OS) is system software that manages computer hardware and software resources and provides common services for computer programs. The dominant desktop operating system is Microsoft Windows with a market share of around 82.74%. macOS by Apple Inc. is in second place (13.23%), and the varieties of Linux are collectively in third place (1.57%). In the mobile (smartphone and tablet combined) sector, use in 2017 is up to 70% of Google's Android and according to third quarter 2016 data, Android on smartphones is dominant with 87.5 percent and a growth rate 10.3 percent per year, followed by Apple's iOS with 12.1 percent and a per year decrease in market share of 5.2 percent, while other operating systems amount to just 0.3 percent. Linux distributions are dominant in the server and supercomputing sectors. Other specialized classes of operating systems, such as embedded and real-time systems, exist for many applications. Pictured: The Digital Revolution in Just 10 Years! 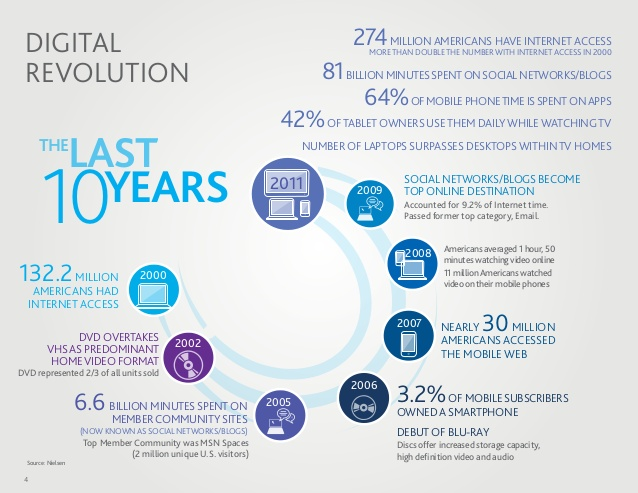 The Digital Revolution, known as the Third Industrial Revolution, is the change from mechanical and analogue electronic technology to digital electronics which began anywhere from the late 1950s to the late 1970s with the adoption and proliferation of digital computers and digital record keeping that continues to the present day. Implicitly, the term also refers to the sweeping changes brought about by digital computing and communication technology during (and after) the latter half of the 20th century. Analogous to the Agricultural Revolution and Industrial Revolution, the Digital Revolution marked the beginning of the Information Age. Central to this revolution is the mass production and widespread use of digital logic circuits, and its derived technologies, including the computer, digital cellular phone, and the Internet. Unlike older machines, digital computers can be reprogrammed to fit any purpose. Computer science is the study of the theory, experimentation, and engineering that form the basis for the design and use of computers. It is the scientific and practical approach to computation and its applications and the systematic study of the feasibility, structure, expression, and mechanization of the methodical procedures (or algorithms) that underlie the acquisition, representation, processing, storage, communication of, and access to, information. An alternate, more succinct definition of computer science is the study of automating algorithmic processes that scale. A computer scientist specializes in the theory of computation and the design of computational systems. See glossary of computer science. Computer Science fields can be divided into a variety of theoretical and practical disciplines. Some fields, such as computational complexity theory (which explores the fundamental properties of computational and intractable problems), are highly abstract, while fields such as computer graphics emphasize real-world visual applications. Other fields still focus on challenges in implementing computation. For example, programming language theory considers various approaches to the description of computation, while the study of computer programming itself investigates various aspects of the use of programming language and complex systems. Human–computer interaction considers the challenges in making computers and computations useful, usable, and universally accessible to humans. High technology, or "High Tech" is technology that is at the cutting edge: the most advanced technology available. As of the onset of the 21st century, products considered high tech are often those that incorporate advanced computer electronics. However, there is no specific class of technology that is high tech—the definition shifts and evolves over time—so products hyped as high-tech in the past may now be considered to be everyday or outdated technology. The opposite of high tech is low technology, referring to simple, often traditional or mechanical technology; for example, a calculator is a low-tech calculating device. Silicon Valley is a nickname for the southern portion of the Bay Area, in the northern part of the U.S. state of California. The "valley" in its name refers to the Santa Clara Valley in Santa Clara County, which includes the city of San Jose and surrounding cities and towns, where the region has been traditionally centered. The region has expanded to include the southern half of the Peninsula in San Mateo County, and southern portions of the East Bay in Alameda County. The word "silicon" originally referred to the large number of silicon chip innovators and manufacturers in the region, but the area is now the home to many of the world's largest high-tech corporations, including the headquarters of 39 businesses in the Fortune 1000, and thousands of startup companies. Silicon Valley also accounts for one-third of all of the venture capital investment in the United States, which has helped it to become a leading hub and startup ecosystem for high-tech innovation and scientific development. It was in the Valley that the silicon-based integrated circuit, the microprocessor, and the microcomputer, among other key technologies, were developed. As of 2013, the region employed about a quarter of a million information technology workers. As more high-tech companies were established across San Jose snd the Santa Clara Valley, and then north towards the Bay Area's two other major cities, San Francisco and Oakland, the "Silicon Valley" has come to have two definitions: a geographic one, referring to Santa Clara County, and a metonymical one, referring to all high-tech businesses in the Bay Area or even in the United States. The term is now generally used as a synecdoche for the American high-technology economic sector. The name also became a global synonym for leading high-tech research and enterprises, and thus inspired similar named locations, as well as research parks and technology centers with a comparable structure all around the world. Click here for a List of the Largest IT Companies based on Revenues. ​Information technology (IT) is the application of computers to store, retrieve, transmit and manipulate data, often in the context of a business or other enterprise. IT is considered a subset of information and communications technology (ICT). In 2012, Zuppo proposed an ICT hierarchy where each hierarchy level "contain some degree of commonality in that they are related to technologies that facilitate the transfer of information and various types of electronically mediated communications." Business/IT was one level of the ICT hierarchy. The term is commonly used as a synonym for computers and computer networks, but it also encompasses other information distribution technologies such as television and telephones. Humans have been storing, retrieving, manipulating and communicating information since the Sumerians in Mesopotamia developed writing in about 3000 BC, but the term information technology in its modern sense first appeared in a 1958 article published in the Harvard Business Review; authors Harold J. Leavitt and Thomas L. Whisler commented that "the new technology does not yet have a single established name. We shall call it information technology (IT)." Their definition consists of three categories: techniques for processing, the application of statistical and mathematical methods to decision-making, and the simulation of higher-order thinking through computer programs. Based on the storage and processing technologies employed, it is possible to distinguish four distinct phases of IT development: pre-mechanical (3000 BC – 1450 AD), mechanical (1450–1840), electromechanical (1840–1940) electronic (1940–present), and moreover, IT as a service. This article focuses on the most recent period (electronic), which began in about 1940. "One of the most important capabilities that smartphones now have is knowing where they are. More than desktops, laptops, personal navigation devices or even tablets, which are harder to take with you, a smartphone can combine its location with many other pieces of data to make new services available. "There's a gamification aspect, there's a social aspect, and there's a utilitarian aspect," said analyst Avi Greengart of Current Analysis. Greengart believes cellphone location is in its second stage, moving beyond basic mapping and directions to social and other applications. The third stage may bring uses we haven't even foreseen. Like other digital technologies, these new capabilities come with worries as well as benefits. Consumers are particularly concerned about privacy when it comes to location because knowing where you are has implications for physical safety from stalking or arrest, said Seth Schoen, senior staff technologist at the Electronic Frontier Foundation. Yet most people have embraced location-based services without thinking about dangers such as service providers handing over location data in lawsuits or hackers stealing it from app vendors. "This transition has been so quick that people haven't exactly thought through the implications on a large scale," Schoen said. "Most people aren't even very clear on which location technologies are active and which are passive." Many app-provider practices are buried in long terms of service. Risk increases with the number of apps that you authorize to collect location data, according to Schoen, so consumers have at least one element of control. GPS was developed by the U.S. Department of Defense and was first included in cellphones in the late 1990s. It's still the best-known way to find your location outdoors. GPS uses a constellation of satellites that send location and timing data from space directly to your phone. If the phone can pick up signals from three satellites, it can show where you are on a flat map, and with four, it can also show your elevation. Other governments have developed their own systems similar to GPS, but rather than conflicting with it, they can actually make outdoor location easier. Russia's GLONASS is already live and China's Compass is in trials. This works well once your phone finds three or four satellites, but that may take a long time, or not happen at all if you're indoors or in an "urban canyon" of buildings that reflect satellite signals. Assisted GPS describes a collection of tools that help to solve that problem. One reason for the wait is that when it first finds the satellites, the phone needs to download information about where they will be for the next four hours. The phone needs that information to keep tracking the satellites. As soon as the information reaches the phone, full GPS service starts. Carriers can now send that data over a cellular or Wi-Fi network, which is a lot faster than a satellite link. This may cut GPS startup time from 45 seconds to 15 seconds or less, though it's still unpredictable, said Guylain Roy-MacHabee, CEO of location technology company RX Networks. The form of assisted GPS described above still requires an available data network and the time to transmit the satellite information. Synthetic GPS uses computing power to forecast satellites' locations days or weeks in advance. This function began in data centers but increasingly can be carried out on phones themselves, according to Roy-MacHabee of RX, which specializes in this type of technology. With such a cache of satellite data on board, a phone often can identify its location in two seconds or less, he said. However, all the technologies that speed up GPS still require the phone to find three satellites. Carriers already know how to locate phones without GPS, and they knew it before phones got the feature. Carriers figure out which cell a customer is using, and how far they are from the neighboring cells, with a technology called Cell ID. By knowing which sector of which base station a given phone is using, and using a database of base-station identification numbers and locations, the carriers can associate the phone's location with that of the cell tower. This system tends to be more precise in urban areas with many small cells than in rural areas, where cells may cover an area several kilometers in diameter. Wi-fi can do much the same thing as Cell ID, but with greater precision because Wi-Fi access points cover a smaller area. There are actually two ways Wi-Fi can be used to determine location. The most common, called RSSI (received signal strength indication), takes the signals your phone detects from nearby access points and refers to a database of Wi-Fi networks. The database says where each uniquely identified access point is located. Using signal strength to determine distance, RSSI determines where you are (down to tens of meters) in relation to those known access points. The other form of Wi-Fi location, wireless fingerprinting, uses profiles of given places that are based on the pattern of Wi-Fi signals found there. This technique is best for places that you or other cellphone users visit frequently. The fingerprint may be created and stored the first time you go there, or a service provider may send someone out to stand in certain spots in a building and record a fingerprint for each one. Fingerprinting can identify your location to within just a few meters, said Charlie Abraham, vice president of engineering at Broadcom's GPS division, which makes chipsets that can use a variety of location mechanisms. If you go into a place where no wireless system works, inertial sensors can keep track of your location based on other inputs. Most smartphones now come with three inertial sensors: a compass (or magnetometer) to determine direction, an accelerometer to report how fast your phone is moving in that direction, and a gyroscope to sense turning motions. Together, these sensors can determine your location with no outside inputs, but only for a limited time. They'll work for minutes, but not tens of minutes, Broadcom's Abraham said. The classic use case is driving into a tunnel: If the phone knows your location from the usual sources before you enter, it can then determine where you've gone from the speed and direction you're moving. More commonly, these tools are used in conjunction with other location systems, sometimes compensating for them in areas where they are weak, Abraham said. Outdoor navigation on a sidewalk or street typically happens on one level, either going straight or making right or left turns. But indoors, it makes a difference what floor of the building you're on. GPS could read this, except that it's usually hard to get good GPS coverage indoors or even in urban areas, where the satellite signals bounce off tall buildings. One way to determine elevation is a barometer, which uses the principle that air gets thinner the farther up you go. Some smartphones already have chips that can detect barometric pressure, but this technique isn't usually suited for use by itself, RX's Roy-MacHabee said. To use it, the phone needs to pull down local weather data for a baseline figure on barometric pressure, and conditions inside a building such as heating or air-conditioning flows can affect the sensor's accuracy, he said. ​A barometer works best with mobile devices that have been carefully calibrated for a specific building, so it might work in your own office but not in a public library, Roy-MacHabee said. Barometers are best used in combination with other tools, including GPS, Wi-Fi and short-range systems that register that you've gone past a particular spot. Sometimes just detecting whether someone has entered a certain area says something about what they're doing. This can be done with short-range wireless systems, such as RFID (radio-frequency identification) with a badge. NFC (near-field communication) is starting to appear in phones and could be used for checkpoints, but manufacturers' main intention for NFC is payments. However, shopper loyalty company Shopkick is already using a short-range system to verify that consumers have walked into a store. Instead of using a radio, Shopkick broadcasts ultrasonic tones just inside the doors of a shop. If the customer has the Shopkick app running when they walk through the door, the phone will pick up the tone through its microphone and the app will tell Shopkick that they've entered. The shopper can earn points, redeemable for gift cards and other rewards, just for walking into the store, and those show up immediately. Shopkick developed the ultrasonic system partly because the tones can't penetrate walls or windows, which would let people collect points just for walking by, CTO Aaron Emigh said. They travel about 150 feet (46 meters) inside the store. Every location of every store has a unique set of tones, which are at too high a frequency for humans to hear. Dogs can hear them, but tests showed they don't mind, Emigh said. Very precise location can be achieved in a specific area, such as inside a retail store, using beacons that send out signals via Bluetooth. The beacons, smaller than a cellphone, are placed every few meters and can communicate with any mobile device equipped with Bluetooth 4.0, the newest version of the standard. Using a technique similar to Wi-Fi fingerprinting, the venue owner can use signals from this dense network of transmitters to identify locations within the space, Broadcom's Abraham said. Nokia, which is participating in a live in-store trial of Bluetooth beacons, says the system can determine location to within 10 centimeters. With location sensing that specific, a store could tell when you were close to a specific product on a shelf and offer a promotion, according to Nokia. Australian startup Locata is trying to overcome GPS' limitations by bringing it down to Earth. The company makes location transmitters that use the same principle as GPS but are mounted on buildings and cell towers. Because they are stationary and provide a much stronger signal to receivers than satellites do from space, Locata's radios can pinpoint a user's location almost instantly to as close as 2 inches, according to Locata CEO Nunzio Gambale. Locata networks are also more reliable than GPS, he said. The company's receivers currently cost about $2500 and are drawing interest from transportation, defense and public safety customers, but within a few years the technology could be an inexpensive add-on to phones, according to Gambale. Then, service providers will be its biggest customers, he said. Another company in this field, NextNav, is building a network using licensed spectrum that it says can cover 93 percent of the U.S. population. NextNav's transmitters will be deployed in a ring around each city and take advantage of the long range of its 900MHz spectrum, said Chris Gates, vice president of strategy and development. ​The Global Positioning System (GPS) is a space-based navigation system that provides location and time information in all weather conditions, anywhere on or near the Earth where there is an unobstructed line of sight to four or more GPS satellites. The system provides critical capabilities to military, civil, and commercial users around the world. The United States government created the system, maintains it, and makes it freely accessible to anyone with a GPS receiver. The U.S. began the GPS project in 1973 to overcome the limitations of previous navigation systems, integrating ideas from several predecessors, including a number of classified engineering design studies from the 1960s. The U.S. Department of Defense (DoD) developed the system, which originally used 24 satellites. It became fully operational in 1995. Roger L. Easton, Ivan A. Getting and Bradford Parkinson are credited with inventing it. Advances in technology and new demands on the existing system have now led to efforts to modernize the GPS and implement the next generation of GPS Block IIIA satellites and Next Generation Operational Control System (OCX). Announcements from Vice President Al Gore and the White House in 1998 initiated these changes. In 2000, the U.S. Congress authorized the modernization effort, GPS III. In addition to GPS, other systems are in use or under development. The Russian Global Navigation Satellite System (GLONASS) was developed contemporaneously with GPS, but suffered from incomplete coverage of the globe until the mid-2000s. There are also the planned European Union Galileo positioning system, China's BeiDou Navigation Satellite System, the Japanese Quasi-Zenith Satellite System, and India's Indian Regional Navigation Satellite System. Intel Corporation (also known as Intel, stylized as intel) is an American multinational corporation and technology company headquartered in Santa Clara, California, in the Silicon Valley. It is the world's second largest and second highest valued semiconductor chip makers based on revenue after being overtaken by Samsung, and is the inventor of the x86 series of microprocessors, the processors found in most personal computers (PCs). Intel supplies processors for computer system manufacturers such as Apple, Lenovo, HP, and Dell. 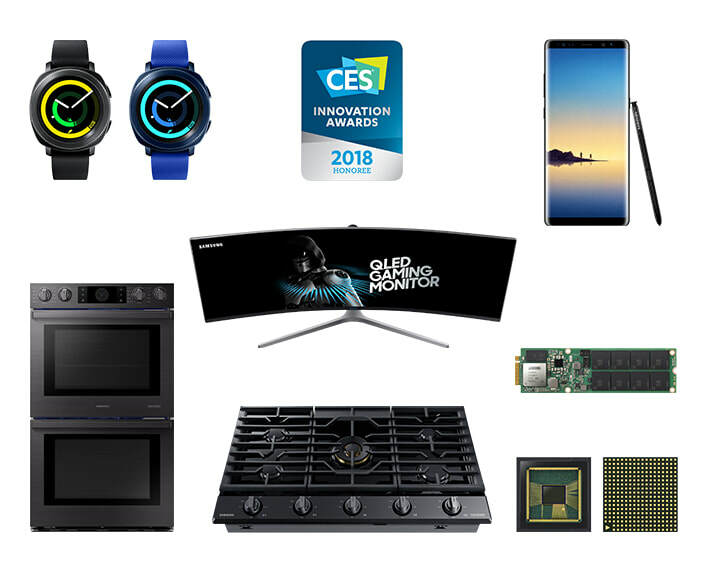 Intel also manufactures motherboard chipsets, network interface controllers and integrated circuits, flash memory, graphics chips, embedded processors and other devices related to communications and computing. Intel Corporation was founded on July 18, 1968, by semiconductor pioneers Robert Noyce and Gordon Moore (of Moore's law fame), and widely associated with the executive leadership and vision of Andrew Grove. The company's name was conceived as portmanteau of the words integrated and electronics, with co-founder Noyce having been a key inventor of the integrated circuit (microchip). The fact that "intel" is the term for intelligence information also made the name appropriate. Intel was an early developer of SRAM and DRAM memory chips, which represented the majority of its business until 1981. Although Intel created the world's first commercial microprocessor chip in 1971, it was not until the success of the personal computer (PC) that this became its primary business. During the 1990s, Intel invested heavily in new microprocessor designs fostering the rapid growth of the computer industry. During this period Intel became the dominant supplier of microprocessors for PCs and was known for aggressive and anti-competitive tactics in defense of its market position, particularly against Advanced Micro Devices (AMD), as well as a struggle with Microsoft for control over the direction of the PC industry. Advanced Micro Devices, Inc. (AMD) is an American multinational semiconductor company based in Sunnyvale, California, United States, that develops computer processors and related technologies for business and consumer markets. While initially it manufactured its own processors, the company later outsourced its manufacturing, a practice known as fabless, after GlobalFoundries was spun off in 2009. AMD's main products include microprocessors, motherboard chipsets, embedded processors and graphics processors for servers, workstations and personal computers, and embedded systems applications. 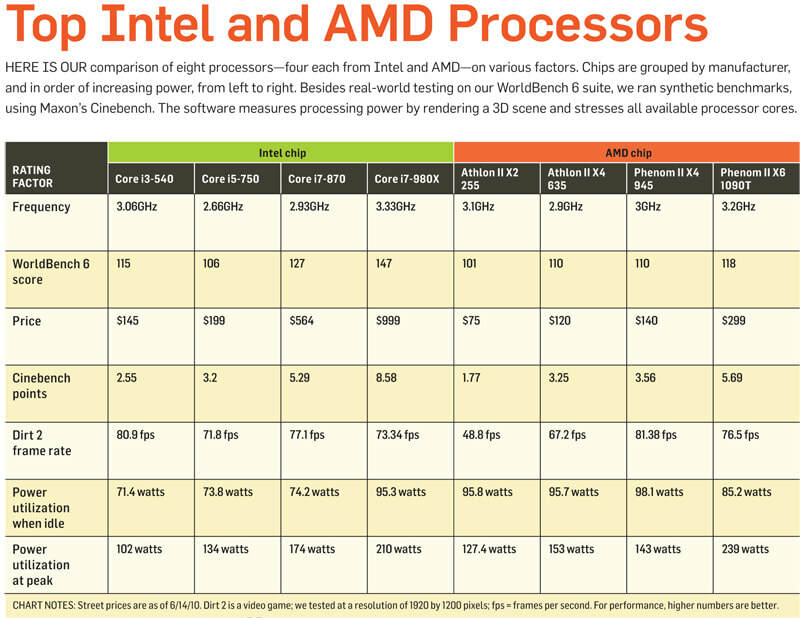 AMD is the second-largest supplier and only significant rival to Intel in the market for x86-based microprocessors. Since acquiring ATI in 2006, AMD and its competitor Nvidia have dominated the discrete Graphics Processing Unit (GPU) market. ​Samsung Electronics Co., Ltd. is a South Korean multinational electronics company headquartered in Suwon, South Korea. Through extremely complicated ownership structure with some circular ownership, it is the flagship company of the Samsung Group, accounting for 70% of the group's revenue in 2012. Samsung Electronics has assembly plants and sales networks in 80 countries and employs around 308,745 people. It is the world's second-largest information technology company by revenue. As of October 2017, Samsung Electronics' market cap stood at US$372.0 billion. Samsung has long been a major manufacturer of electronic components such as lithium-ion batteries, semiconductors, chips, flash memory and hard drive devices for clients such as Apple, Sony, HTC and Nokia. Samsung is the world's largest manufacturer of mobile phones and smartphones fueled by the popularity of its Samsung Galaxy line of devices. The company is also a major vendor of tablet computers, particularly its Android-powered Samsung Galaxy Tab collection, and is generally regarded as pioneering the phablet market through the Samsung Galaxy Note family of devices. Samsung has been the world's largest television manufacturer since 2006, and the world's largest manufacturer of mobile phones since 2011. It is also the world's largest memory chips manufacturer. In July 2017, Samsung Electronics overtook Intel as the largest semiconductor chip maker in the world. Samsung, like many other South Korean family-run chaebols, has been criticized for low dividend payouts and other governance practices that favor controlling shareholders at the expense of ordinary investors. In 2012, Kwon Oh-hyun was appointed the company's CEO but announced in October 2017 that he would resign in March 2018, citing an "unprecedented crisis". Relationship with Best Buy Co., Inc.
and the HomePod smart speaker. and the iLife and iWork creativity and productivity suites. Apple was founded by Steve Jobs, Steve Wozniak, and Ronald Wayne in April 1976 to develop and sell Wozniak's Apple I personal computer. It was incorporated as Apple Computer, Inc. in January 1977, and sales of its computers, including the Apple II, saw significant momentum and revenue growth for the company. Within a few years, Jobs and Wozniak had hired a staff of computer designers and had a production line. Apple went public in 1980 to instant financial success. 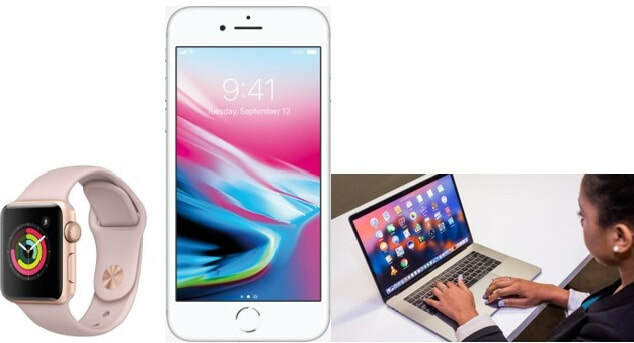 Over the next few years, Apple shipped new computers featuring innovative graphical user interfaces, and Apple's marketing commercials for its products received widespread critical acclaim. However, the high price tag of its products and limited software titles caused problems, as did power struggles between executives at the company. Jobs resigned from Apple and created his own company. As the market for personal computers increased, Apple's computers saw diminishing sales due to lower-priced products from competitors, in particular those offered with the Microsoft Windows operating system. More executive job shuffles happened at Apple until then-CEO Gil Amelio in 1997 decided to buy Jobs' company to bring him back. Jobs regained position as CEO, and began a process to rebuild Apple's status, which included opening Apple's own retail stores in 2001, making numerous acquisitions of software companies to create a portfolio of software titles, and changed some of the hardware technology used in its computers. It again saw success and returned to profitability. In January 2007, Jobs announced that Apple Computer, Inc. would be renamed Apple Inc. to reflect its shifted focus toward consumer electronics and announced the iPhone, which saw critical acclaim and significant financial success. In August 2011, Jobs resigned as CEO due to health complications, and Tim Cook became the new CEO. Two months later, Jobs died, marking the end of an era for the company. Apple is the world's largest information technology company by revenue and the world's second-largest mobile phone manufacturer after Samsung. In February 2015, Apple became the first U.S. company to be valued at over US$700 billion. The company employs 123,000 full-time employees as of September 2017 and maintains 498 retail stores in 22 countries as of July 2017. It operates the iTunes Store, which is the world's largest music retailer. As of January 2016, more than one billion Apple products are actively in use worldwide. Apple's worldwide annual revenue totaled $229 billion for the 2017 fiscal year. The company enjoys a high level of brand loyalty and has been repeatedly ranked as the world's most valuable brand. However, it receives significant criticism regarding the labor practices of its contractors and its environmental and business practices, including the origins of source materials. Sony Corporation (often referred to simply as Sony) is a Japanese multinational conglomerate corporation headquartered in Kōnan, Minato, Tokyo. The company is one of the leading manufacturers of electronic products for the consumer and professional markets. Sony was ranked 105th on the 2017 list of Fortune Global 500.
and financial services (banking and insurance). Sony is among the semiconductor sales leaders and as of 2016, the fifth-largest television manufacturer in the world after Samsung Electronics, LG Electronics, TCL and Hisense. The company's current slogan is BE MOVED. Their former slogans were The One and Only (1980–1982), It's a Sony (1982–2002), like.no.other (2005–2009), and make.believe (2009–2014). Sony has a weak tie to the Sumitomo Mitsui Financial Group (SMFG) keiretsu, the successor to the Mitsui keiretsu. 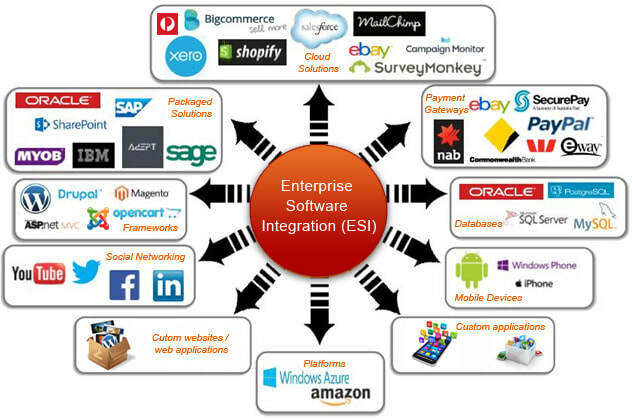 Pictured: Enterprise Software Integration is the service offered by the Team at 11 Media when our clients require cost-efficient IT solution integration between two or more software applications or services utilized across their business. Enterprise software, also known as enterprise application software (EAS), is computer software used to satisfy the needs of an organization rather than individual users. Such organizations include businesses, schools, interest-based user groups, clubs, charities, and governments. Enterprise software is an integral part of a (computer-based) information system. Enterprise software can be categorized by business function. Each type of enterprise application can be considered a "system" due to the integration with a firm's business processes. Categories of enterprise software may overlap due to this systemic interpretation. For example, IBM's Business Intelligence platform (Cognos), integrates with a predictive analytics platform (SPSS) and can obtain records from its database packages (Infosphere, DB2). Blurred lines between package functions make delimitation difficult, and in many ways larger software companies define these somewhat arbitrary categories. Research and development (R&D), is a general term for activities in connection with corporate or governmental innovation. 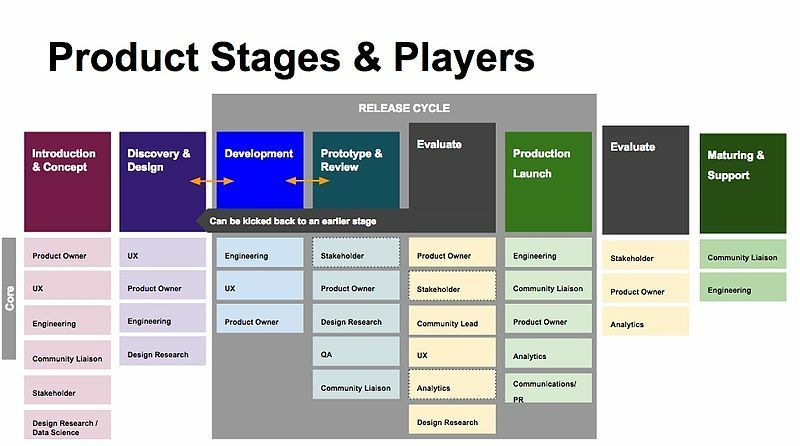 Research and development is a component of Innovation and is situated at the front end of the Innovation life cycle. Innovation builds on R&D and includes commercialization phases. The activities that are classified as R&D differ from company to company, but there are two primary models, with an R&D department being either staffed by engineers and tasked with directly developing new products, or staffed with industrial scientists and tasked with applied research in scientific or technological fields which may facilitate future product development. In either case, R&D differs from the vast majority of corporate activities in that it is not often intended to yield immediate profit, and generally carries greater risk and an uncertain return on investment. Click here for a List of Programming Languages by Type. The earliest known programmable machine that preceded the invention of the digital computer was the automatic flute player described in the 9th century by the brothers Musa in Baghdad, during the Islamic Golden Age. From the early 1800s, "programs" were used to direct the behavior of machines such as Jacquard looms and player pianos. Thousands of different programming languages have been created, mainly in the computer field, and many more still are being created every year. Many programming languages require computation to be specified in an imperative form (i.e., as a sequence of operations to perform) while other languages use other forms of program specification such as the declarative form (i.e. the desired result is specified, not how to achieve it). The description of a programming language is usually split into the two components of syntax (form) and semantics (meaning). Some languages are defined by a specification document (for example, the C programming language is specified by an ISO Standard) while other languages (such as Perl) have a dominant implementation that is treated as a reference. Some languages have both, with the basic language defined by a standard and extensions taken from the dominant implementation being common. A computer programming language is a language used to write computer programs, which involves a computer performing some kind of computation or algorithm and possibly control external devices such as printers, disk drives, robots, and so on. For example, PostScript programs are frequently created by another program to control a computer printer or display. More generally, a programming language may describe computation on some, possibly abstract, machine. It is generally accepted that a complete specification for a programming language includes a description, possibly idealized, of a machine or processor for that language. In most practical contexts, a programming language involves a computer; consequently, programming languages are usually defined and studied this way. Programming languages differ from natural languages in that natural languages are only used for interaction between people, while programming languages also allow humans to communicate instructions to machines. Programming languages usually contain abstractions for defining and manipulating data structures or controlling the flow of execution. The practical necessity that a programming language support adequate abstractions is expressed by the abstraction principle; this principle is sometimes formulated as a recommendation to the programmer to make proper use of such abstractions. Markup languages like XML, HTML, or troff, which define structured data, are not usually considered programming languages. Programming languages may, however, share the syntax with markup languages if a computational semantics is defined. XSLT, for example, is a Turing complete XML dialect. Moreover, LaTeX, which is mostly used for structuring documents, also contains a Turing complete subset. The term computer language is sometimes used interchangeably with programming language. However, the usage of both terms varies among authors, including the exact scope of each. One usage describes programming languages as a subset of computer languages. In this vein, languages used in computing that have a different goal than expressing computer programs are generically designated computer languages. For instance, markup languages are sometimes referred to as computer languages to emphasize that they are not meant to be used for programming. ​Another usage regards programming languages as theoretical constructs for programming abstract machines, and computer languages as the subset thereof that runs on physical computers, which have finite hardware resources. ​John C. Reynolds emphasizes that formal specification languages are just as much programming languages as are the languages intended for execution. He also argues that textual and even graphical input formats that affect the behavior of a computer are programming languages, despite the fact they are commonly not Turing-complete, and remarks that ignorance of programming language concepts is the reason for many flaws in input formats. 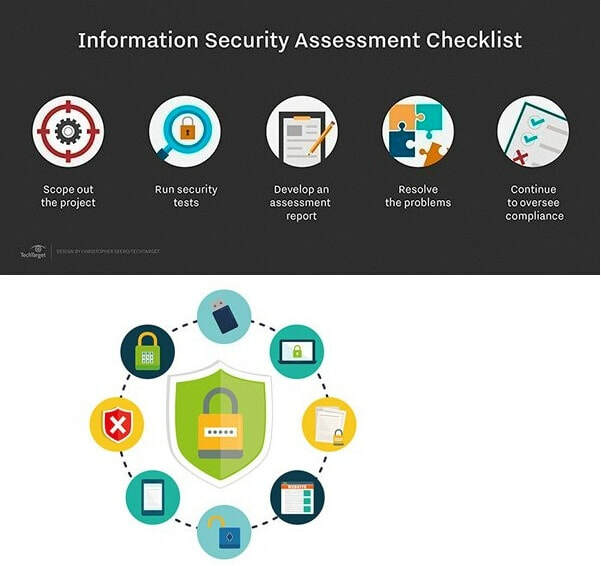 Information security, sometimes shortened to InfoSec, is the practice of preventing unauthorized access, use, disclosure, disruption, modification, inspection, recording or destruction of information. It is a general term that can be used regardless of the form the data may take (e.g., electronic, physical). Information security's primary focus is the balanced protection of the confidentiality, integrity and availability of data (also known as the CIA triad) while maintaining a focus on efficient policy implementation, all without hampering organization productivity. This is largely achieved through a multi-step risk management process that identifies assets, threat sources, vulnerabilities, potential impacts, and possible controls, followed by assessment of the effectiveness of the risk management plan. This standardization may be further driven by a wide variety of laws and regulations that affect how data is accessed, processed, stored, and transferred. However, the implementation of any standards and guidance within an entity may have limited effect if a culture of continual improvement isn't adopted. 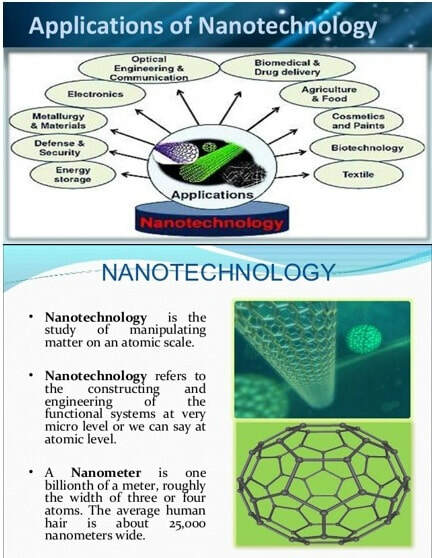 Nanotechnology ("nanotech") is manipulation of matter on an atomic, molecular, and supramolecular scale. The earliest, widespread description of nanotechnology referred to the particular technological goal of precisely manipulating atoms and molecules for fabrication of macroscale products, also now referred to as molecular nanotechnology. A more generalized description of nanotechnology was subsequently established by the National Nanotechnology Initiative, which defines nanotechnology as the manipulation of matter with at least one dimension sized from 1 to 100 nanometers. This definition reflects the fact that quantum mechanical effects are important at this quantum-realm scale, and so the definition shifted from a particular technological goal to a research category inclusive of all types of research and technologies that deal with the special properties of matter which occur below the given size threshold. It is therefore common to see the plural form "nanotechnologies" as well as "nanoscale technologies" to refer to the broad range of research and applications whose common trait is size. Because of the variety of potential applications (including industrial and military), governments have invested billions of dollars in nanotechnology research. Through 2012, the USA has invested $3.7 billion using its National Nanotechnology Initiative, the European Union has invested $1.2 billion, and Japan has invested $750 million. ​The associated research and applications are equally diverse, ranging from extensions of conventional device physics to completely new approaches based upon molecular self-assembly, from developing new materials with dimensions on the nanoscale to direct control of matter on the atomic scale. On the other hand, nanotechnology raises many of the same issues as any new technology, including concerns about the toxicity and environmental impact of nanomaterials, and their potential effects on global economics, as well as speculation about various doomsday scenarios. These concerns have led to a debate among advocacy groups and governments on whether special regulation of nanotechnology is warranted. A personal computer (PC) is a multi-purpose computer whose size, capabilities, and price make it feasible for individual use. PCs are intended to be operated directly by an end user, rather than by a computer expert or technician. Computer time-sharing models that were typically used with larger, more expensive minicomputer and mainframe systems, to enable them be used by many people at the same time, are not used with PCs. Early computer owners in the 1960s, invariably institutional or corporate, had to write their own programs to do any useful work with the machines. In the 2010s, personal computer users have access to a wide range of commercial software, free software ("freeware") and free and open-source software, which are provided in ready-to-run form. Software for personal computers is typically developed and distributed independently from the hardware or OS manufacturers. Many personal computer users no longer need to write their own programs to make any use of a personal computer, although end-user programming is still feasible. This contrasts with mobile systems, where software is often only available through a manufacturer-supported channel, and end-user program development may be discouraged by lack of support by the manufacturer. Since the early 1990s, Microsoft operating systems and Intel hardware have dominated much of the personal computer market, first with MS-DOS and then with Windows. Alternatives to Microsoft's Windows operating systems occupy a minority share of the industry. These include Apple's macOS and free and open-source Unix-like operating systems such as Linux. 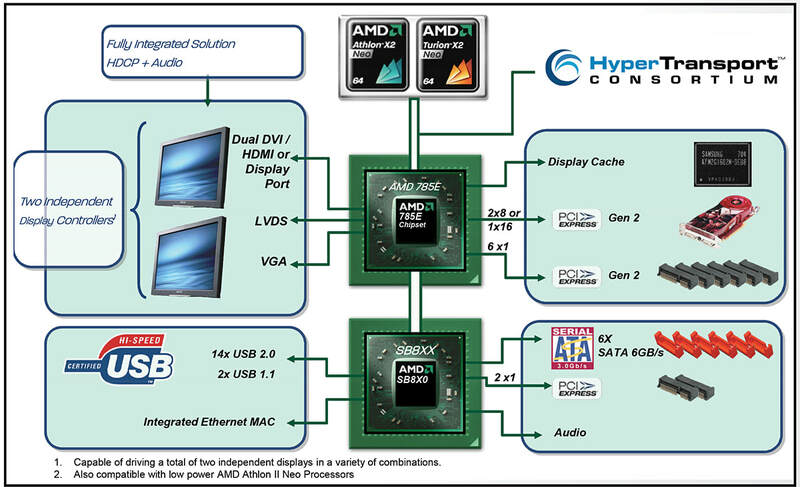 Advanced Micro Devices (AMD) provides the main alternative to Intel's processors. The history of the personal computer as a mass-market consumer electronic device began with the microcomputer revolution of the 1980s. The 1981 launch of the IBM Personal Computer coined both the term Personal Computer and PC. A personal computer is one intended for interactive individual use, as opposed to a mainframe computer where the end user's requests are filtered through operating staff, or a time-sharing system in which one large processor is shared by many individuals. After the development of the microprocessor, individual personal computers were low enough in cost that they eventually became affordable consumer goods. Early personal computers – generally called microcomputers – were sold often in electronic kit form and in limited numbers, and were of interest mostly to hobbyists and technicians. 1977 and the emergence of the "Trinity"
Educ-8 a 1974 pre-microprocessor "micro-computer"
The annual worldwide market share of personal computer vendors includes desktop computers, laptop computers and netbooks, but excludes mobile devices, such as tablet computers that do not fall under the category of 2-in-1 PCs. Pictured below: The Growth in CPUs based on Transistor Count = 1950 (1) to 2010s (8 Billion) or a factor of 8 billion! Timeline of computing presents events in the history of computing organized by year and grouped into six topic areas: predictions and concepts, first use and inventions, hardware systems and processors, operating systems, programming languages, and new application areas. In computer networks, computing devices exchange data with each other using connections between nodes (data links.) These data links are established over cable media such as wires or optic cables, or wireless media such as WiFi. Network computer devices that originate, route and terminate the data are called network nodes. Nodes can include hosts such as personal computers, phones, servers as well as networking hardware. Two such devices can be said to be networked together when one device is able to exchange information with the other device, whether or not they have a direct connection to each other. In most cases, application-specific communications protocols are layered (i.e. carried as payload) over other more general communications protocols. This formidable collection of information technology requires skilled network management to keep it all running reliably. Computer networks support an enormous number of applications and services such as access to the World Wide Web, digital video, digital audio, shared use of application and storage servers, printers, and fax machines, and use of email and instant messaging applications as well as many others. Computer networks differ in the transmission medium used to carry their signals, communications protocols to organize network traffic, the network's size, topology, traffic control mechanism and organizational intent. The best-known computer network is the Internet. Local Area Network (LAN) is a computer network that interconnects computers within a limited area such as a residence, school, laboratory, university campus or office building. By contrast, a wide area network (WAN: see next topic) not only covers a larger geographic distance, but also generally involves leased telecommunication circuits. Ethernet and Wi-Fi are the two most common technologies in use for local area networks. Historical technologies include ARCNET, Token ring, and AppleTalk. A Wide Area Network (WAN) is a telecommunications network or computer network that extends over a large geographical distance/place. Wide area networks are often established with leased telecommunication circuits. Business, education and government entities use wide area networks to relay data to staff, students, clients, buyers, and suppliers from various locations across the world. In essence, this mode of telecommunication allows a business to effectively carry out its daily function regardless of location. The Internet may be considered a WAN. ​Related terms for other types of networks are personal area networks (PANs), local area networks (LANs), campus area networks (CANs), or metropolitan area networks(MANs) which are usually limited to a room, building, campus or specific metropolitan area respectively. "What is WAN (wide area network)? - Definition from WhatIs.com". SearchEnterpriseWAN. Retrieved 2017-04-21. The client–server model is a distributed application structure that partitions tasks or workloads between the providers of a resource or service, called servers, and service requesters, called clients. Often clients and servers communicate over a computer network on separate hardware, but both client and server may reside in the same system. A server host runs one or more server programs which share their resources with clients. A client does not share any of its resources, but requests a server's content or service function. Clients therefore initiate communication sessions with servers which await incoming requests. Examples of computer applications that use the client–server model are Email, network printing, and the World Wide Web. "What cloud computing is not about is your hard drive. When you store data on or run programs from the hard drive, that's called local storage and computing. Everything you need is physically close to you, which means accessing your data is fast and easy, for that one computer, or others on the local network. Working off your hard drive is how the computer industry functioned for decades; some would argue it's still superior to cloud computing, for reasons I'll explain shortly. For the rest of the article by PC Magazine, click here. It is a model for enabling ubiquitous, on-demand access to a shared pool of configurable computing resources (e.g., computer networks, servers, storage, applications and services) which can be rapidly provisioned and released with minimal management effort. Cloud computing and storage solutions provide users and enterprises with various capabilities to store and process their data in either privately owned, or third-party data centers that may be located far from the user–ranging in distance from across a city to across the world. Cloud computing relies on sharing of resources to achieve coherence and economy of scale, similar to a utility (like the electricity grid) over an electricity network. Advocates claim that cloud computing allows companies to avoid up-front infrastructure costs (e.g., purchasing servers). As well, it enables organizations to focus on their core businesses instead of spending time and money on computer infrastructure. Proponents also claim that cloud computing allows enterprises to get their applications up and running faster, with improved manageability and less maintenance, and enables Information technology (IT) teams to more rapidly adjust resources to meet fluctuating and unpredictable business demand. Cloud providers typically use a "pay as you go" model. This will lead to unexpectedly high charges if administrators do not adapt to the cloud pricing model. In 2009, the availability of high-capacity networks, low-cost computers and storage devices as well as the widespread adoption of hardware virtualization, service-oriented architecture, and autonomic and utility computing led to a growth in cloud computing. Companies can scale up as computing needs increase and then scale down again as demands decrease. In 2013, it was reported that cloud computing had become a highly demanded service or utility due to the advantages of high computing power, cheap cost of services, high performance, scalability, accessibility as well as availability. Some cloud vendors are experiencing growth rates of 50% per year, but being still in a stage of infancy, it has pitfalls that need to be addressed to make cloud computing services more reliable and user friendly. YouTube Video: Why are Smartphones so Addictive? Record Shares of Americans Now Own Smartphones, Have Home Broadband. Nearly nine-in-ten Americans today are online, up from about half in the early 2000s. Pew Research Center has chronicled this trend and others through more than 15 years of surveys on internet and technology use. On Thursday, we released a new set of fact sheets that will be updated as we collect new data and can serve as a one-stop shop for anyone looking for information on key trends in digital technology. To mark the occasion, here are four key trends illustrating the current technology landscape in the U.S. Roughly three-quarters of Americans (77%) now own a smartphone, with lower-income Americans and those ages 50 and older exhibiting a sharp uptick in ownership over the past year, according a Pew Research Center survey conducted in November 2016. Smartphone adoption has more than doubled since the Center began surveying on this topic in 2011: That year, 35% of Americans reported that they owned a smartphone of some kind. Smartphones are nearly ubiquitous among younger adults, with 92% of 18- to 29-year-olds owning one. But growth in smartphone ownership over the past year has been especially pronounced among Americans 50 and older. Nearly three-quarters (74%) of Americans ages 50-64 are now smartphone owners (a 16-percentage-point increase compared with 2015), as are 42% of those 65 and older (up 12 points from 2015). There has also been a 12-point increase in smartphone ownership among households earning less than $30,000 per year: 64% of these lower-income Americans now own a smartphone. After a modest decline between 2013 and 2015, the share of Americans with broadband service at home increased by 6 percentage points in 2016. Between 2013 and 2015, the share of Americans with home broadband service decreased slightly – from 70% to 67%. But in the past year, broadband adoption rates have returned to an upward trajectory. As of November 2016, nearly three-quarters (73%) of Americans indicate that they have broadband service at home. But although broadband adoption has increased to its highest level since the Center began tracking this topic in early 2000, not all Americans have shared in these gains. For instance, those who have not graduated from high school are nearly three times less likely than college graduates to have home broadband service (34% vs. 91%). Broadband adoption also varies by factors such as age, household income, geographic location and racial and ethnic background. Even as broadband adoption has been on the rise, 12% of Americans say they are “smartphone dependent” when it comes to their online access – meaning they own a smartphone but lack traditional broadband service at home. The share of Americans who are smartphone dependent has increased 4 percentage points since 2013, and smartphone reliance is especially pronounced among young adults, nonwhites and those with relatively low household incomes. Nearly seven-in-ten Americans now use social media. When the Center started tracking social media adoption in 2005, just 5% of Americans said they used these platforms. Today, 69% of U.S. adults are social media users. Social media is especially popular among younger adults, as 86% of 18- to 29-year-olds are social media users. But a substantial majority of those ages 30-49 (80%) and 50-64 (64%) use social media as well. Only about one-third (34%) of Americans 65 and older currently use social media, but that figure has grown dramatically in recent years: As recently as 2010, only around one-in-ten Americans age 65 and older used social media. Half the public now owns a tablet computer. Though less widespread than smartphones, tablet computers have also become highly common in a very short period of time. When the Center first began tracking tablet ownership in 2010, just 3% of Americans owned a tablet of some kind. That figure has risen to 51% as of November 2016. Ten facts about smartphones as the iPhone turns 10. The iPhone turns 10 on June 29, and the moment warrants a look back at the broader story about the ways mobile devices have changed how people interact. About three-quarters of U.S. adults (77%) say they own a smartphone, up from 35% in 2011, making the smartphone one of the most quickly adopted consumer technologies in recent history. Smartphone ownership is more common among those who are younger or more affluent. For example, 92% of 18- to 29-year-olds say they own a smartphone, compared with 42% of those who are ages 65 and older. Still, adoption rates have risen rapidly among older and lower-income Americans in recent years. From 2013 to 2016, the share of adults 65 and older who report owning a smartphone has risen 24 percentage points (from 18% to 42%). There has also been a 12-point increase in smartphone ownership among households earning less than $30,000 per year: 64% of these lower-income Americans now own a smartphone. Half of younger adults live in a household with three or more smartphones. More than nine-in-ten 18- to 29-year-olds (96%) say they live in a household with at least one smartphone, and 51% of young adults say their home contains three or more such devices. Still, many older adults also live in households with multiple smartphones. For example, 39% of 30- to 49-year-olds and 29% of 50- to 64-year-olds say their home contains three or more smartphones. This is far less common, however, among those 65 and older, with just 11% saying it applies to their household. Mobile devices aren’t just for calling or texting. Americans are using their phones for a variety of nontraditional phone activities, such as looking for a job, finding a date or reading a book. Some 28% of U.S. adults said in a 2015 Pew Research Center survey that they have used a smartphone as part of a job search. This is especially common among younger adults, with 53% of 18- to 29-year-olds reporting doing this. Other Pew Research Center data show that 9% of U.S. adults say they have used mobile dating apps, while the share of Americans who say they read an e-book using a cellphone within the past year increased from 5% in 2011 to 13% in 2016. The smartphone is becoming an important tool for shoppers. While around half of U.S. adults (51%) report making online purchases via their smartphone, many are also turning to their phones while in a physical store. In a 2015 Pew Research Center survey, 59% of U.S. adults say that they have used their cellphone to call or text someone while inside a store to discuss purchases they are thinking of making. Just under half (45%) have used their phones while inside a store to look up online reviews or to try and find a better price online for something they are thinking of purchasing. And a relatively small share of Americans (12%) have used their cellphones to physically pay for in-store purchases. Growing shares of Americans – especially those who are lower-income – rely on smartphones to access the internet. Overall, 12% of U.S. adults were “smartphone-only” internet users in 2016 – meaning they owned a smartphone but did not have broadband internet at home. This represents an increase from 8% in 2013. Reliance on smartphones to go online varies greatly by income. One-in-five adults whose annual household income falls below $30,000 are smartphone-only internet users, compared with only 4% of those living in households earning $100,000 or more. ​More than half of smartphone owners say they get news alerts on their phones, but few get these alerts frequently.Some 55% of smartphone owners say they ever get news alerts on their phones’ screens, according to a 2016 Pew Research Center survey. However, few users say they receive these types of alerts often, with just 13% of smartphone owners reporting doing this. While smartphones are becoming more integrated into our lives, many users aren’t taking the necessary steps to secure their devices. A 2016 Pew Research Center survey found that 28% of U.S. smartphone owners say they do not use a screen lock or other features to secure their phone. Although a majority of smartphone users say they have updated their phone’s apps or operating system, around four-in-ten say they only update when it’s convenient for them. But some smartphone users forgo updating their phones altogether: 14% say they never update their phone’s operating system, while 10% say they don’t update the apps on their phone. ​Smartphone ownership is climbing in developing nations, but the digital divide remains. Median smartphone adoption in developing nations rose to 37% in 2015, up from 21% in 2013, according to a Pew Research Center survey of 21 emerging and developing nations conducted in 2015. But advanced economies still have considerably higher rates of smartphone adoption, with the highest rates among surveyed countries found in South Korea, Sweden, Australia, the Netherlands and Spain. Around the globe – including in advanced economies – a digital divide in smartphone ownership still exists between the young and old, and between more educated and less educated people. Americans have different views about where it is and isn’t appropriate to use a cellphone. In a 2014 Pew Research Center survey, roughly three-quarters of adults said it was OK for people to use their phones while walking down the street, riding public transit or waiting in line, but far fewer found it acceptable to use cellphones during a meeting, at the movies or in church. Regardless of how they feel about the appropriateness of using a phone in social settings, an overwhelming majority of mobile phone owners (89%) say they did use their phones during their most recent social gathering. The smartphone is essential for many owners, but a slight majority says it’s not always needed. Some 46% of smartphone owners said their smartphone is something “they couldn’t live without,” compared with 54% who said in a 2014 Pew Research Center survey that their phone is “not always needed.” Perhaps surprisingly, smartphone owners who depend on their mobile device for internet access are not significantly more inclined than those who have multiple options for going online to say they couldn’t live without their phone (49% vs. 46%). In addition to being essential for many, smartphone owners are much more likely to have positive views of these devices. For instance, they are much more likely to say smartphones are more helpful than annoying, represent freedom rather than represent a leash, enable connecting rather than being distracting and are worth the cost rather than being a financial burden. Note: The figures and map on global smartphone adoption were updated June 29, 2017, to include more recent data. A computing platform is, in the most general sense, whatever a pre-existing piece of computer software or code object is designed to run within, obeying its constraints, and making use of its facilities. The term computing platform can refer to different abstraction levels, including a certain hardware architecture, an operating system (OS), and runtime libraries. In total it can be said to be the stage on which computer programs can run. Binary executables have to be compiled for a specific hardware platform, since different central processor units have different machine codes. In addition, operating systems and runtime libraries allow re-use of code and provide abstraction layers which allow the same high-level source code to run on differently configured hardware. For example, there are many kinds of data storage device, and any individual computer can have a different configuration of storage devices; but the application is able to call a generic save or write function provided by the OS and runtime libraries, which then handle the details themselves. A platform can be seen both as a constraint on the application development process – the application is written for such-and-such a platform – and an assistance to the development process, in that they provide low-level functionality ready-made. Hardware alone, in the case of small embedded systems. Embedded systems can access hardware directly, without an OS (see bare metal (computing)). A virtual machine (VM) such as the Java virtual machine. or .NET CLR. Applications are compiled into a format similar to machine code, known as bytecode, which is then executed by the VM. A virtualized version of a complete system, including virtualized hardware, OS, software and storage. These allow, for instance, a typical Windows program to run on what is physically a Mac. Some architectures have multiple layers, with each layer acting as a platform to the one above it. In general, a component only has to be adapted to the layer immediately beneath it. For instance, a Java program has to be written to use the Java virtual machine (JVM) and associated libraries as a platform, but does not have to be adapted to run for the Windows, Linux or Macintosh OS platforms. However, the JVM, the layer beneath the application, does have to be built separately for each OS. Operating system examples: For more details on this topic, see List of operating systems. Software frameworks: For more details on this topic, see Software framework. Software is considered first party if it is originated by the platform vendor. Software from other vendors is considered Third party. 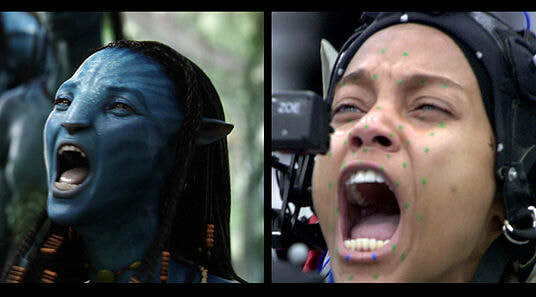 YouTube Video: "Avatar Pushes Limits of Visual Effects"
Computer-generated imagery (CGI for short) is the application of computer graphics to create or contribute to images in art, printed media, video games, films, television programs, shorts, commercials, videos, and simulators. The visual scenes may be dynamic or static, and may be two-dimensional (2D), though the term "CGI" is most commonly used to refer to 3D computer graphics used for creating scenes or special effects in films and television. Additionally, the use of 2D CGI is often mistakenly referred to as "traditional animation", most often in the case when dedicated animation software such as Adobe Flash or Toon Boom is not used or the CGI is hand drawn using a tablet and mouse. The term 'CGI animation' refers to dynamic CGI rendered as a movie. The term virtual world refers to agent-based, interactive environments. Computer graphics software is used to make computer-generated imagery for films, etc. Availability of CGI software and increased computer speeds have allowed individual artists and small companies to produce professional-grade films, games, and fine art from their home computers. This has brought about an Internet subculture with its own set of global celebrities, clichés, and technical vocabulary. The evolution of CGI led to the emergence of virtual cinematography in the 1990s where runs of the simulated camera are not constrained by the laws of physics. Not only do animated images form part of computer-generated imagery, natural looking landscapes (such as fractal landscapes) are also generated via computer algorithms. A simple way to generate fractal surfaces is to use an extension of the triangular mesh method, relying on the construction of some special case of a de Rham curve, e.g. midpoint displacement. For instance, the algorithm may start with a large triangle, then recursively zoom in by dividing it into four smaller Sierpinski triangles, then interpolate the height of each point from its nearest neighbors. The creation of a Brownian surface may be achieved not only by adding noise as new nodes are created, but by adding additional noise at multiple levels of the mesh. Thus a topographical map with varying levels of height can be created using relatively straightforward fractal algorithms. Some typical, easy-to-program fractals used in CGI are the plasma fractal and the more dramatic fault fractal. The large number of specific techniques have been researched and developed to produce highly focused computer-generated effects — e.g. the use of specific models to represent the chemical weathering of stones to model erosion and produce an "aged appearance" for a given stone-based surface. Architectural modelling tools allow an architect to visualize a space and perform "walk-throughs" in an interactive manner, thus providing "interactive environments" both at the urban and building levels. Specific applications in architecture not only include the specification of building structures (such as walls and windows) and walk-throughs, but the effects of light and how sunlight will affect a specific design at different times of the day. Architectural modelling tools have now become increasingly internet-based. However, the quality of internet-based systems still lags behind those of sophisticated inhouse modelling systems. See also: Medical imaging, Visible Human Project, Google Body, and Living Human Project. Computer generated models used in skeletal animation are not always anatomically correct. However, organizations such as the Scientific Computing and Imaging Institute have developed anatomically correct computer-based models. Computer generated anatomical models can be used both for instructional and operational purposes. To date, a large body of artist produced medical images continue to be used by medical students, such as images by Frank Netter, e.g. Cardiac images. However, a number of online anatomical models are becoming available. A single patient X-ray is not a computer generated image, even if digitized. However, in applications which involve CT scans a three dimensional model is automatically produced from a large number of single slice x-rays, producing "computer generated image". Applications involving magnetic resonance imaging also bring together a number of "snapshots" (in this case via magnetic pulses) to produce a composite, internal image. In modern medical applications, patient specific models are constructed in 'computer assisted surgery'. For instance, in total knee replacement, the construction of a detailed patient specific model can be used to carefully plan the surgery. These three dimensional models are usually extracted from multiple CT scans of the appropriate parts of the patient's own anatomy. Such models can also be used for planning aortic valve implantations, one of the common procedures for treating heart disease. Given that the shape, diameter and position of the coronary openings can vary greatly from patient to patient, the extraction (from CT scans) of a model that closely resembles a patient's valve anatomy can be highly beneficial in planning the procedure. The finest visible features such as fine wrinkles and skin pores are size of about 100 µm or 0.1 millimeters. Skin can be modelled as a 7-dimensional bidirectional texture function (BTF) or a collection of bidirectional scattering distribution function (BSDF) over the target's surfaces. Interactive visualization is a general term that applies to the rendering of data that may vary dynamically and allowing a user to view the data from multiple perspectives. The applications areas may vary significantly, ranging from the visualization of the flow patterns in fluid dynamics to specific computer aided design applications. The data rendered may correspond to specific visual scenes that change as the user interacts with the system — e.g. simulators, such as flight simulators, make extensive use of CGI techniques for representing the world. At the abstract level an interactive visualization process involves a "data pipeline" in which the raw data is managed and filtered to a form that makes it suitable for rendering. This is often called the "visualization data". The visualization data is then mapped to a "visualization representation" that can be fed to a rendering system. This is usually called a "renderable representation". This representation is then rendered as a displayable image. ​As the user interacts with the system (e.g. by using joystick controls to change their position within the virtual world) the raw data is fed through the pipeline to create a new rendered image, often making real-time computational efficiency a key consideration in such applications. While computer generated images of landscapes may be static, the term computer animation only applies to dynamic images that resemble a movie. However, in general the term computer animation refers to dynamic images that do not allow user interaction, and the term virtual world is used for the interactive animated environments. Computer animation is essentially a digital successor to the art of stop motion animation of 3D models and frame-by-frame animation of 2D illustrations. Computer generated animations are more controllable than other more physically based processes, such as constructing miniatures for effects shots or hiring extras for crowd scenes, and because it allows the creation of images that would not be feasible using any other technology. It can also allow a single graphic artist to produce such content without the use of actors, expensive set pieces, or props. A virtual world is a simulated environment, which allows user to interact with animated characters, or interact with other users through the use of animated characters known as avatars. Virtual worlds are intended for its users to inhabit and interact, and the term today has become largely synonymous with interactive 3D virtual environments, where the users take the form of avatars visible to others graphically. These avatars are usually depicted as textual, two-dimensional, or three-dimensional graphical representations, although other forms are possible (auditory and touch sensations for example). Some, but not all, virtual worlds allow for multiple users. Computer-generated imagery has been used in courtrooms, primarily since the early 2000s. However, some experts have argued that it is prejudicial. They are used to help judges or the jury to better visualize the sequence of events, evidence or hypothesis. However, a 1997 study showed that people are poor intuitive physicists and easily influenced by computer generated images. ​Thus it is important that jurors and other legal decision-makers be made aware that such exhibits are merely a representation of one potential sequence of events. Photoshop is the industry standard commercial digital photo editing tool. Its FLOSS counterpart is GIMP. Maya, 3ds Max, Cinema4D, E-on Vue, Poser, and Blender are popular software packages that allow 3D modeling and CGI creation - see also the list of 3D computer graphics software. BOTTOM: in order to serve various industry sectors. Click here for a List of Software. ​Computer software, or simply software, is a generic term that refers to a collection of data or computer instructions that tell the computer how to work, in contrast to the physical hardware from which the system is built, that actually performs the work. In computer science and software engineering, computer software is all information processed by computer systems, programs and data. Computer software includes computer programs, libraries and related non-executable data, such as online documentation or digital media. Computer hardware and software require each other and neither can be realistically used on its own. At the lowest level, executable code consists of machine language instructions specific to an individual processor—typically a central processing unit (CPU). A machine language consists of groups of binary values signifying processor instructions that change the state of the computer from its preceding state. For example, an instruction may change the value stored in a particular storage location in the computer—an effect that is not directly observable to the user. An instruction may also (indirectly) cause something to appear on a display of the computer system—a state change which should be visible to the user. The processor carries out the instructions in the order they are provided, unless it is instructed to "jump" to a different instruction, or is interrupted by the operating system. (By now multi-core processors are dominant, where each core can run instructions in order; then, however, each application software runs only on one core by default, but some software has been made to run on many). The majority of software is written in high-level programming languages that are easier and more efficient for programmers to use because they are closer than machine languages to natural languages. High-level languages are translated into machine language using a compiler or an interpreter or a combination of the two. Software may also be written in a low-level assembly language, which has strong correspondence to the computer's machine language instructions and is translated into machine language using an assembler. Click on any of the following blue hyperlinks for more about Computer Software. Click here for a List of Computer Hardware Companies. Computer hardware are the physical parts or components of a computer, such as the central processing unit, monitor, keyboard, computer data storage, graphic card, sound card and motherboard. By contrast, software is instructions that can be stored and ran by hardware. The template for all modern computers is the Von Neumann architecture, detailed in a 1945 paper by Hungarian mathematician John von Neumann. This describes a design architecture for an electronic digital computer with subdivisions of a processing unit consisting of an arithmetic logic unit and processor registers, a control unit containing an instruction register and program counter, a memory to store both data and instructions, external mass storage, and input and output mechanisms. The meaning of the term has evolved to mean a stored-program computer in which an instruction fetch and a data operation cannot occur at the same time because they share a common bus. This is referred to as the Von Neumann bottleneck and often limits the performance of the system. For the third consecutive year, U.S. business-to-business channel sales (sales through distributors and commercial resellers) increased, ending 2013 up nearly 6 percent at $61.7 billion. The growth was the fastest sales increase since the end of the recession. Sales growth accelerated in the second half of the year peaking in fourth quarter with a 6.9 percent increase over the fourth quarter of 2012. There are a number of different types of computer system in use today. The computer case encloses most of the components of the system. It provides mechanical support and protection for internal elements such as the motherboard, disk drives, and power supplies, and controls and directs the flow of cooling air over internal components. The case is also part of the system to control electromagnetic interference radiated by the computer, and protects internal parts from electrostatic discharge. Large tower cases provide extra internal space for multiple disk drives or other peripherals and usually stand on the floor, while desktop cases provide less expansion room. All-in-one style designs from Apple, namely the iMac, and similar types, include a video display built into the same case. Portable and laptop computers require cases that provide impact protection for the unit. A current development in laptop computers is a detachable keyboard, which allows the system to be configured as a touch-screen tablet. Hobbyists may decorate the cases with colored lights, paint, or other features, in an activity called case modding. The chipset, which includes the north bridge, mediates communication between the CPU and the other components of the system, including main memory. ​An expansion card in computing is a printed circuit board that can be inserted into an expansion slot of a computer motherboard or backplane to add functionality to a computer system via the expansion bus. Expansions cards can be used to obtain or expand on features not offered by the motherboard. As Input: Input devices allow the user to enter information into the system, or control its operation. Most personal computers have a mouse and keyboard, but laptop systems typically use a touchpad instead of a mouse. Other input devices include webcams, microphones, joysticks, and image scanners. As Output: Output devices display information in a human readable form. Such devices could include printers, speakers, monitors or a Braille embosser. IEEE Computer Society (sometimes abbreviated Computer Society or CS) is a professional society of IEEE. Its purpose and scope is "to advance the theory, practice, and application of computer and information processing science and technology" and the "professional standing of its members." The CS is the largest of 39 technical societies organized under the IEEE Technical Activities Board. The Computer Society sponsors workshops and conferences, publishes a variety of peer-reviewed literature, operates technical committees, and develops IEEE computing standards. The society supports more than 200 chapters worldwide and participates in educational activities at all levels of the profession, including distance learning, accreditation of higher education programs in computer science, and professional certification in software engineering. The IEEE Computer Society is also a member organization of the Federation of Enterprise Architecture Professional Organizations (a worldwide association of professional organizations which have come together to provide a forum to standardize, professionalize, and otherwise advance the discipline of Enterprise Architecture). Adobe Inc. is an American multinational computer software company headquartered in San Jose, California. It has historically focused upon the creation of multimedia and creativity software products, with a more recent foray towards digital marketing software. Adobe is best known for its deprecated Adobe Flash web software ecosystem, Photoshop image editing software, Acrobat Reader, the Portable Document Format (PDF), and Adobe Creative Suite, as well as its successor Adobe Creative Cloud. Adobe was founded in December 1982 by John Warnock and Charles Geschke, who established the company after leaving Xerox PARC in order to develop and sell the PostScript page description language. In 1985, Apple Computer licensed PostScript for use in its LaserWriter printers, which helped spark the desktop publishing revolution. and San Francisco, California in the United States. Adobe has also major development operations in Noida and Bangalore in India. A microstock agency that presently provides over 57 million high-resolution, royalty-free images and videos available to license (via subscription or credit purchase methods). On December 11, 2014, Adobe announced it was buying Fotolia for $800 million in cash, aiming at integrating the service to its Creative Cloud solution. The purchase was completed in January 2015. It is run as a stand-alone website. In March 2019 Adobe released its Adobe Experience Platform, which consists family of content, development, and customer relationship management products, with what it’s calling the “next generation” of its Sensei artificial intelligence and machine learning framework. "Patents owned by Adobe Systems". US Patent & Trademark Office. Retrieved December 8, 2005. Microsoft Corporation (MS) is an American multinational technology company with headquarters in Redmond, Washington. It develops, manufactures, licenses, supports and sells computer software, consumer electronics, personal computers, and related services. Microsoft's best known software products are the Microsoft Windows line of operating systems, the Microsoft Office suite, and the Internet Explorer and Edge web browsers. Microsoft's flagship hardware products are the Xbox video game consoles and the Microsoft Surface lineup of touchscreen personal computers. As of 2016, it is the world's largest software maker by revenue, and one of the world's most valuable companies. The word "Microsoft" is a portmanteau of "microcomputer" and "software". Microsoft is ranked No. 30 in the 2018 Fortune 500 rankings of the largest United States corporations by total revenue. Microsoft was founded by Bill Gates and Paul Allen on April 4, 1975, to develop and sell BASIC interpreters for the Altair 8800. It rose to dominate the personal computer operating system market with MS-DOS in the mid-1980s, followed by Microsoft Windows. The company's 1986 initial public offering (IPO), and subsequent rise in its share price, created three billionaires and an estimated 12,000 millionaires among Microsoft employees. Since the 1990s, it has increasingly diversified from the operating system market and has made a number of corporate acquisitions, their largest being the acquisition of LinkedIn for $26.2 billion in December 2016, followed by their acquisition of Skype Technologies for $8.5 billion in May 2011. 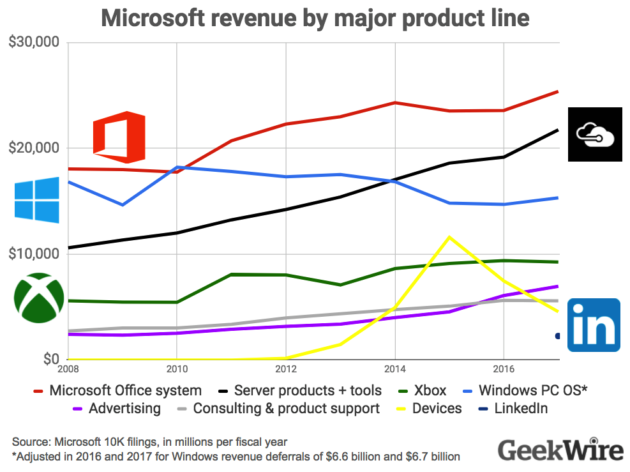 As of 2015, Microsoft is market-dominant in the IBM PC-compatible operating system market and the office software suite market, although it has lost the majority of the overall operating system market to Android. The company also produces a wide range of other consumer and enterprise software for desktops and servers, including Internet search (with Bing), the digital services market (through MSN), mixed reality (HoloLens), cloud computing (Azure) and software development (Visual Studio). Steve Ballmer replaced Gates as CEO in 2000, and later envisioned a "devices and services" strategy. This began with the acquisition of Danger Inc. in 2008, entering the personal computer production market for the first time in June 2012 with the launch of the Microsoft Surface line of tablet computers; and later forming Microsoft Mobile through the acquisition of Nokia's devices and services division. Since Satya Nadella took over as CEO in 2014, the company has scaled back on hardware and has instead focused on cloud computing, a move that helped the company's shares reach its highest value since December 1999. In 2018, Microsoft surpassed Apple as the most valuable publicly traded company in the world after being dethroned by the tech giant in 2010. A media player is a computer program/software for playing multimedia files like audios, videos, movies and music. Media players commonly display standard media control icons known from physical devices such as tape recorders and CD players, such as play, pause, fast-forward, back-forward, and stop buttons. In addition, they generally have progress bars (or "playback bars") to locate the current position in the duration of the media file. while macOS comes with QuickTime Player and iTunes. Android OS comes with Google Play Music as default media player and many apps like Poweramp and VLC Media Player. Different media players may have different goals and feature sets. Video players are a group of media players that have their features geared more towards playing digital video. For example, Windows DVD Player exclusively plays DVD-Video discs and nothing else. Media Player Classic can play individual audio and video files but many of its features such as color correction, picture sharpening, zooming, set of hotkeys, DVB support and subtitle support are only useful for video material such as films and cartoons. Audio players, on the other hand, specialize in digital audio. For example, AIMP exclusively plays audio formats. 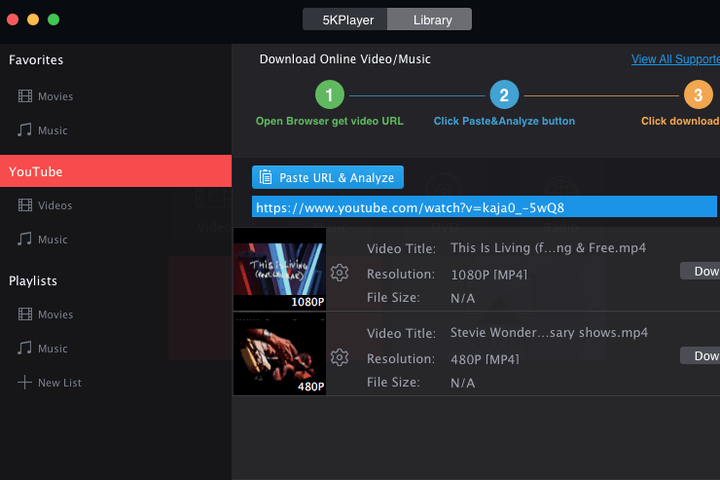 MediaMonkey can play both audio and video format but many of its features including media library, lyric discovery, music visualization, online radio, audiobook indexing and tag editing are geared toward consumption of audio material. In addition, watching video files on it can be a trying feat. General-purpose media players also do exist. For example, Windows Media Player has exclusive features for both audio and video material, although it cannot match the feature set of Media Player Classic and MediaMonkey combined. 3D video players are used to play 2D video in 3D format. A high-quality three-dimensional video presentation requires that each frame of a motion picture be embedded with information on the depth of objects present in the scene. This process involves shooting the video with special equipment from two distinct perspectives or modelling and rendering each frame as a collection of objects composed of 3D vertices and textures, much like in any modern video game, to achieve special effects. Tedious and costly, this method is only used in a small fraction of movies produced worldwide, while most movies remain in the form of traditional 2D images. It is, however, possible to give an otherwise two-dimensional picture the appearance of depth. Using a technique known as anaglyph processing a "flat" picture can be transformed so as to give an illusion of depth when viewed through anaglyph glasses (usually red-cyan). An image viewed through anaglyph glasses appears to have both protruding and deeply embedded objects in it, at the expense of somewhat distorted colours. The method itself is old enough, dating back to mid-19th century, but it is only with recent advances in computer technology that it has become possible to apply this kind of transformation to a series of frames in a motion picture reasonably fast or even in real time, i.e. as the video is being played back. Several implementations exist in the form of 3D video players that render conventional 2D video in anaglyph 3D, as well as in the form of 3D video converters that transform video into stereoscopic anaglyph and transcode it for playback with regular software or hardware video players. A home theater PC or media center computer is a convergence device that combines some or all the capabilities of a personal computer with a software application that supports video, photo, audio playback, and sometimes video recording functionality. Although computers with some of these capabilities were available from the late 1980s, the "Home Theater PC" term first appeared in mainstream press in 1996. Since 2007, other types of consumer electronics, including gaming systems and dedicated media devices have crossed over to manage video and music content. The term "media center" also refers to specialized computer programs designed to run on standard personal computers.